Our biggest score of the past weekend was almost everyone’s biggest score; at least those TwinSpires harness bettors that were following the Meadowlands on Jan. 7. The challenge on the track’s second program of the historic new meet offered a million TwinSpires Club points to be won and/or shared to the players who hit the highest mutuel payoff for a $9 win bet. On the TwinSpires Facebook page Saturday afternoon, we posted four possible horses to go that evening that might offer the highest mutuel. In Race 3, we suggested Electrofire, the 10 horse. The Jean Drolet pacer went off at $20.50, won and paid $43. Until Race 10, Electrofire was the highest mutuel payoff. With only three races left on the program, Race 10 presented two tough trips for public choices and a 25-1 shot, seventh in the stretch with a lot more pace then the tired favorites, won and paid $52. The $43 win price, however, was enough to make it a profitable night on the track that was not so affected by a new surface, as we predicted. Congratulations to the lucky winner(s) of the challenge. We almost handed you the points. Upstairs at Woodbine, we nailed one elim of the Willowdale Series’ first leg with Mystician, at $7.50. At Cal Expo, where we offered some suggestions for the no-takeout Pick 4, we were not productive. Our selections finished 5th, 7th / scratched / 7th, 4th / 4th. From the Pompano watch list (H2W), Keystone Thomas won, paying $6.40. On Monday, Jan. 9, Don’t Call Us may race off the also-eligible from the H2W in Race 10. For the past few decades, California harness racing has survived extinction but never the peril of it. The once thriving western circuit which offered, one time or another, harness racing in the north and south at Los Alamitos, Hollywood Park, Cal-Expo, Bay Meadows, Fairplex Park and even Del Mar and Santa Anita, was saved again a few years ago to its sole outpost, Cal-Expo in Sacramento. Now, Cal-Expo harness faces closure. The next meet, scheduled to begin Aug. 24, 2012, is lacking an operator. The track is currently advertising for such a person or organization, so that the Golden State’s standardbred community can ensue. Sources say there have been “a few inquiries” but no takers as of this writing. Two of those interested parties were from out of state. An electronic billboard outside one of the entrances to the Exposition fairgrounds broadcasts that possible operators should get in contact by e-mail to obtain information about lease terms. Trainer Lou Pena was refused participation in the current Meadowlands meet and that sparked a legal battle now in progress. 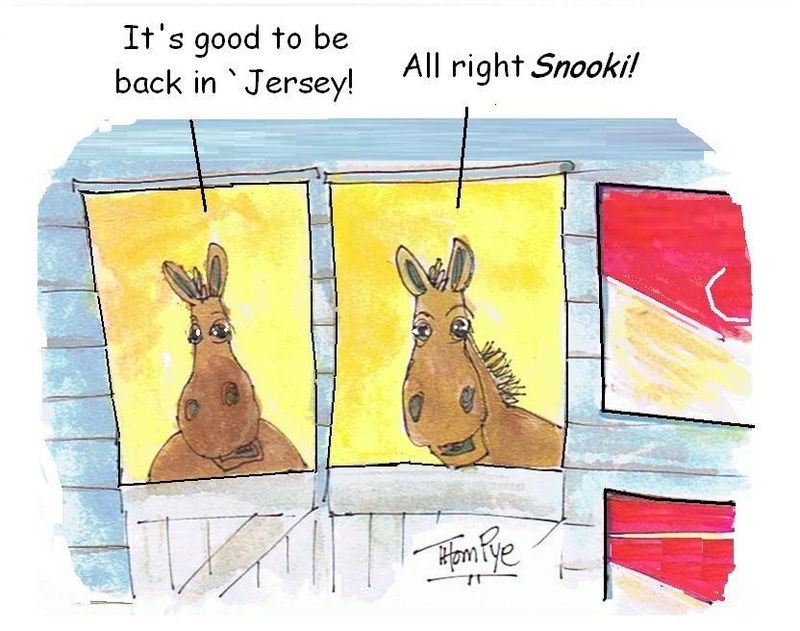 Pena has filed a lawsuit against new owner-operator Jeff Gural and the New Jersey Sports and Exposition Authority, seeking an immediate injunction against the order that would allow him to enter horses at the track. Read an article by John Brennan on northjersey.com by clicking here. We broke the following story just after the Harrisburg yearling sale and now it is official. The 2010 Three-Year-Old Filly Pacer of the Year, Put On A Show, who didn’t race in 2011 due to surgery to remove a bone chip in a knee, is aimed toward the Overbid Series that starts March 2 at the Meadowlands. 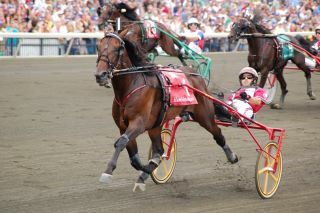 Put On A Show is one of 21 nominations to the Overbid Series for older pacing mares, which includes Anndrovette. After opening legs on March 2 and March 9, the $120,000 (est.) Overbid Final is scheduled for Saturday, March 17.